At first we visited the Kaiservilla - the imperial summer residence of Emperor Franz Joseph I. After a very interesting tour through the villa, we walked through the park to the "Marble Palace", the former tea house of Empress Elisabeth, which nowadays houses a photography museum. Then we stopped off at the Café and Cake Shop Zauner (the former "k.u.k. Hoflieferant" = "Imperial and Royal Purveyor to the Court") for an Afternoon Tea. Our winter trip ended with a cozy carriage ride through the town of Bad Ischl. We wish all our dear readers Merry Christmas and a very Happy New Year! 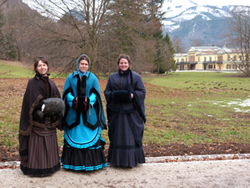 Our this years winter trip led us to the old Austrian Emperors city Bad Ischl.